The C7 comes with big Brembo 4 piston brakes as standard equipment. The base front rotor is 12.6 inches in diameter, and the rear rotor is 13.3 inches. 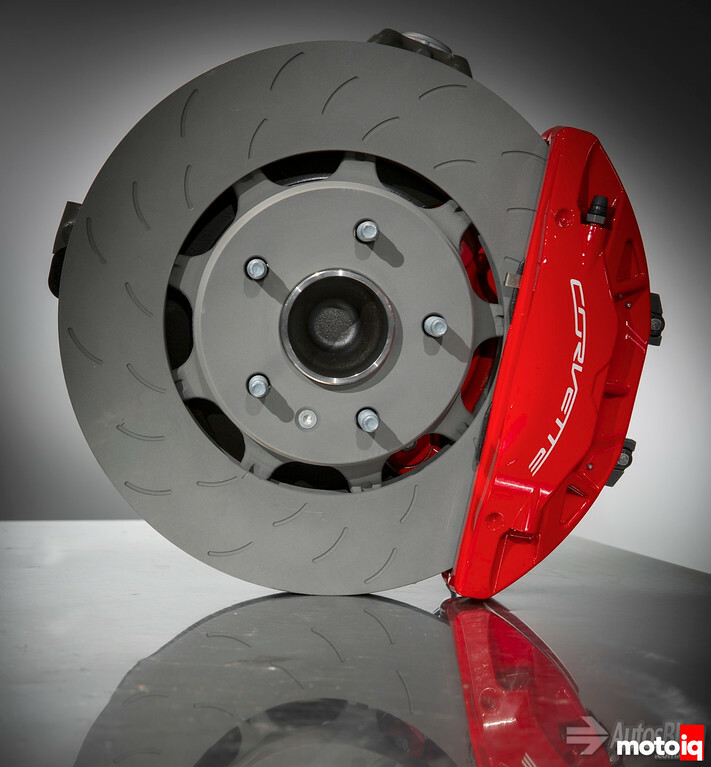 Our Z51 came with larger front brake rotors than the base C7. 13.6 inches vs the 12.6 standard size. The slotted rotors only come on the Z51 as well. The base and Z51 rotors are one piece and vented. 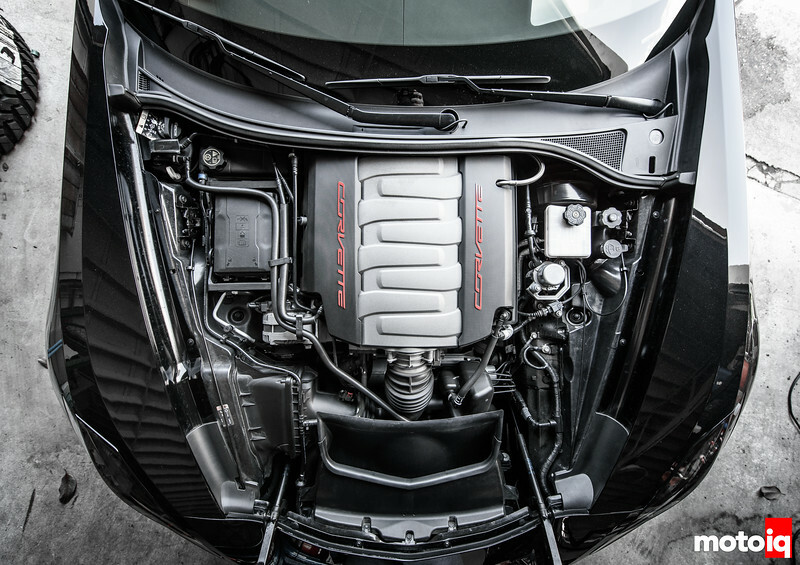 The engine in the C7 is worthy of supercar status. Even though it still has old school features like its Chevy Small Block ancestors of 62 years ago such as 2 valves per cylinder, a single cam in the block and pushrods, the C7's engine is still one of the most technically advanced engine currently in production. 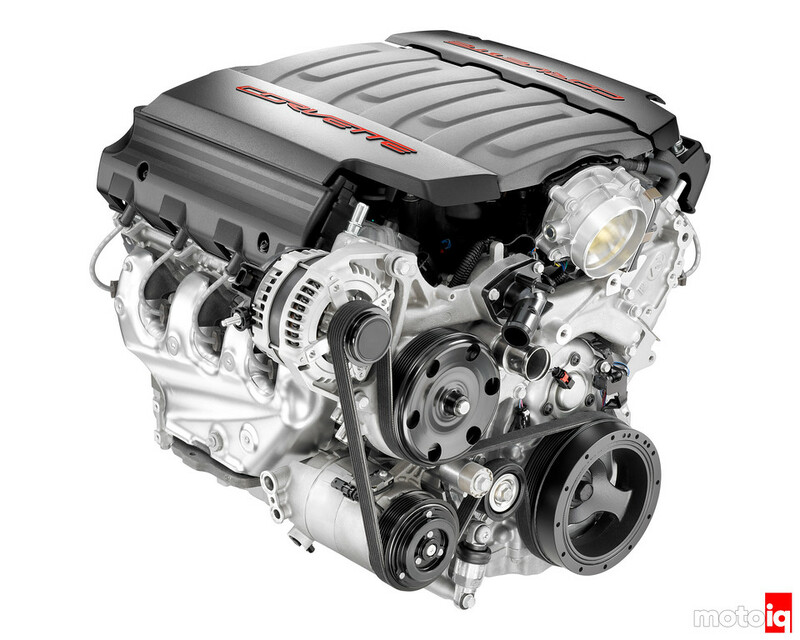 The C7 comes with the new LT1 engine which is an evolution of the venerable LS platform. Although the LT1 shares a lot of the basic specs of the LS one like block deck, bearing dimensions and bore spacing, it is really an all-new engine breaking new grounds in power, emissions compliance, and efficiency. The engine is different enough to be given a new generation number. So different is the LT1 that the only parts that are carried over from the LS3 are the wrist pins, wrist pin locks, the valve spring retainers and keepers, a few assorted bolts and the crank key! The new engine is called a Gen V or the 5th generation Chevy small block. Here is a view of the new Gen V LT1 from the top. Like the LS the LT1 is small, light and tightly packaged. An interesting thing to note is that the engine is completely behind the front axle centerline making this a front midships engine location. This combined with the rear mounted transaxle makes for excellent weight distribution. On our model, 49% of the car's weight is on the front wheels and 51% over the rears. The C7 actually has a slight rearward weight bias! The new Gen V LT1 is a 6.2L just like the outgoing LS3 this engine replaces as the base engine in the C7. The new LT1 is as big of news as the LS1 was back in the day with improvements in fuel economy, emissions, and power output. The LT1 packs 460 hp and 465 lb/ft of torque with our cars optional Z51 performance exhaust. This is up from the LS3's 436 hp and 428 lb/ft of torque while getting 17 city mpg and 29 mpg on the highway up from the LS3's 15 mpg city and 25 mpg highway. More power, better fuel economy, and cleaner emissions, what more could you ask for! To get these gains, the LT1 has a lot of active engine control; VVT (Variable Valve Technology) which can control the cam advance or retard with 60 degrees of control authority, AFM (Active Fuel Management ) which is a fuel-saving 4 cylinder operation mode and DI (Direct Injection). 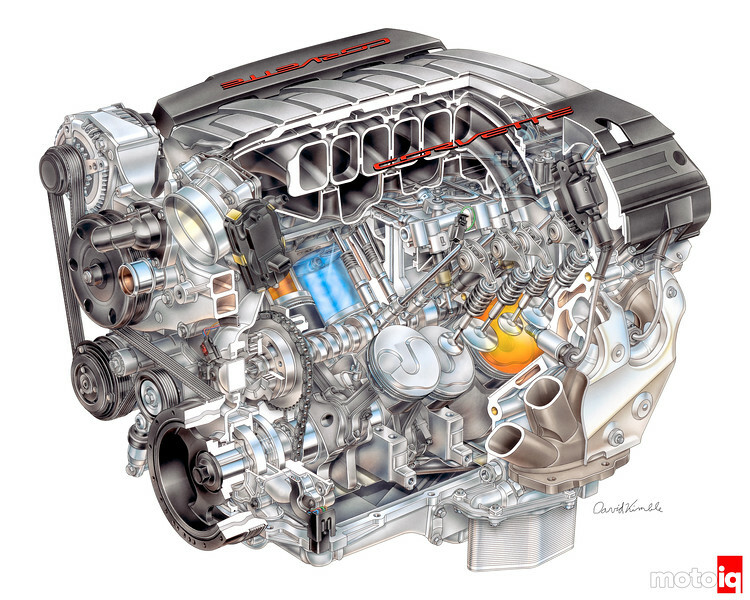 Chevy devoted tons of engineering time to the development of the LT1 more than any other engine in their history. Over 10 million hours were dedicated to the computer-aided design of the engine, with a whopping 6 million of those hours devoted to its new combustion system. Thirty analysts worked for three years before the first physical test engine was built. The engineers evaluated every component in the engine, from the connecting rods to the rocker covers. Inside the engine, the shapes and configurations of the rotating parts were evaluated for mass optimization, ensuring the highest quality and durability were achieved with the lightest, most efficient possible parts. Once the LT1'S V's basic design was refined on computers, the engineers constructed prototype engines and tested them on a variety of dynamometers. The LT1 is so technically advanced with tons of innovative and even revolutionary features, it deserves for us to take a closer look at its internals in the next segment of Project Stingray.